It has been a daily drum beat. Today “people with knowledge of the matter” told Bloomberg that BlackRock, the world’s largest asset manager, would whittle down its workforce of 13,000 by about 3%, or 400 jobs, the largest round of layoffs at the firm ever. Layoffs in the tech sector, including startups, have graced the news recently. Layoffs in oil and gas have been going on since 2014. Other sectors have been trimming here and there. Corporate sales are down. Earnings are down even more. And the pressure is on to do something about it. Hence the efforts to cut expenses. But it’s not happening in huge numbers. It’s a steady trickle. And so far, it has not shown up in the weekly unemployment claims reported by the Department of Labor, which remain low. There appear to be still enough job offers out there – except in oil and gas, where the entire industry is laying off – so that many of these laid-off workers can be absorbed by other companies, and they might already have a new job lined up by the time they leave their current employer. So they would not file a claim for unemployment insurance and would thus stay out of the unemployment claims data reported every Thursday. And there is still a lot of hiring going on to more than make up for these job losses, according to ADP which reported today that private-sector employment in March increased by 200,000 from February on a seasonally adjusted basis. 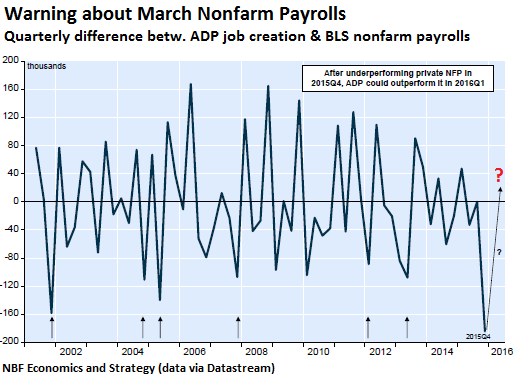 Alas, the ADP report has an intriguing relationship with the market-moving Nonfarm Payroll (NFP) report which the Bureau of Labor Statistics releases the Friday after the ADP report – so in two days. And this relationship could turn into a nasty surprise on Friday, warns Krishen Rangasamy, senior economist at NBF Economics and Strategy. It points out that the ADP number was above consensus expectations, thus “reinforcing market expectations that there will be yet another 200K+ print for non-farm payrolls.” But these folks might get disappointed. Now we’re in the last month of that “following quarter.” Just to revert to the historic mean, the BLS’s reports for the three months in Q1 would have to be about 190,000 jobs lower than ADP’s. ADP’s first quarter total is just under 600,000 jobs. So the BLS’s total, including Friday’s numbers, would have to be 410,000 new jobs. 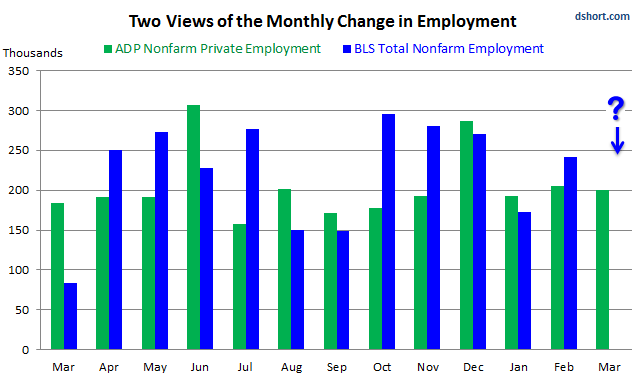 But in January and February, the BLS already reported a combined total of 413,000 new jobs. So, if the difference between the two reverts back to historical averages in March all in one fell swoop, the BLS could release a disastrous report of zero new jobs. Even if the numbers revert back more slowly to the historic alignment with ADP, it would still be a huge disappointment for “consensus economists,” and all heck would break loose — either a gut-wrenching swoon in stocks, or a blistering rally as Wall Street would start clamoring for more QE…. That statistical correction would simply align the BLS with the fundamentals facing businesses in the US, which are not “conducive to a hiring spree in Q1,” as Rangasamy points out. Business revenues and profits have slumped for more than a year, productivity is declining, and economic growth in Q1 is starting to look very ugly, with the Atlanta Fed’s GDPNow model plunging to 0.6% growth annualized, a hair from stagnation, and down from 2.4% earlier in March. Well it seems that we have entered the negative era! Negative rates, negative growth, negative jobs. I’m sure it will all work out. 19 trillion debt, 47 million on SNAP, 95 million out of work force. Go USA you’re #1 again! Bars are doing great and MaryJ weed up, Alcohol sales ever higher, Disability up, Prozac sales up. Enterprise free zone in Detroit slums where cops not dare to go. Gun sales great and bullets too. Crime up and police military hiring the youth to patrol our streets. Debts going up exponentially. Think what is going positive vs negative. God Bless America! So is that why rates are still near zero? Would you bet your life on the BLS numbers being substantially true or substantially false? The bullet is in the revolver Wolf. Would you bet your life on the BLS numbers? If you work 1 hr a week at $7.25 you are employed according to the BLS. You’re helping perpeptuate the current system by treating their numbers and statements as relevant. meaningless propoganda into a rational thesis. They use the language of rational discourse to promote confusion. You’re staring at an ink-blot and seeing butterflies! BLS stands for the Bureau of Lying Statistics. As does the entirety of the financial/politico system. This is how “Deep” the rot runs. Some of the distortion in the unemployment numbers comes from the fact that not every laid off person qualifies for unemployment. In Florida you have to work 20 continuous months to qualify. If you have worked a series of jobs or have had even a month of unemployment in between, you don’t qualify. Most states have made it very hard for workers to qualify for unemployment since the start of the great recession, and nobody addresses it, or even seems to be aware of it. It does show up in the number of pissed off voters. There is a wide discrepancy in the way states deal with unemployment benefit eligibility. Years ago, when my mother became ill I had to leave my job in Sausalito, Ca. to take care of her. I applied for unemployment benefits after she died as my job in California was no longer available. The state of Virginia asked if I wanted to file my claim in California or in Virginia. Thinking Virginia was where I was and being unfamiliar with the system there I thought having a local office was the better idea. How wrong I was! In Virginia, instead of filling out a form listing the jobs/companies you had applied to for work, they handed me a list of jobs I had to apply for. They weren’t choosey either. Since I had worked in Facilities/Physical Plant operations at universities and hospitals in California, in Virginia this opened exciting new career opportunities in the field of janitorial and grounds maintenance work in Virginia including minimum wage temporary jobs with MANPOWER! That paid less than what my unemployment benefits would have been in California but turn it down and you’d lose the meagre benefits offered me! I live in Florida now too and, while retired, I have heard getting on unemployment here is very difficult and the benefits are minimal. All those republicans screaming about the unemployed living the good life in Florida should be aware that the maximum benefit is $250 a week and you have to be a top earner to get it. For a top earner this wouldn’t cover the utility bills. Thus, the results of the last election. 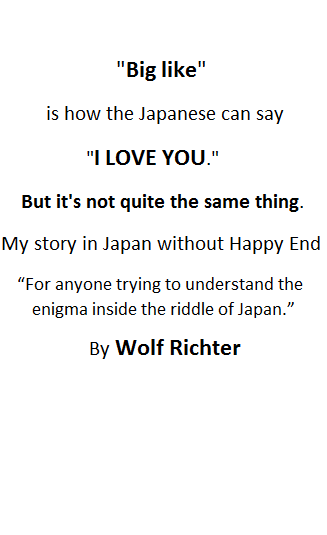 Didn’t know this, thanks for posting. In Ontario (Canada) it is about 6 months of continuous employment and you qualify for EI. Whatever happened to the economic tenet that the wealth of a nation is created in mines, factories and fields. With manufacturing shrinking, mining in decline and agriculture probably treading water, how can job growth be strong? One can live on fat for a while, but this has a real hard limit. The fat was consumed long ago, you are now living of the earnings of the future and sacrificing your children’s and grandchildren’s aspirations by turning them into future slaves. This not only true in the USA but also the UK and all of Europe. The boomers were gifted a golden age and we have squandered it like greedy little rich kids with regard for our future. Now it is time to pay the piper. You’ve got to get rid of the blinkers first and this is harder said than done if you sit in front of TV all the time. 1984 was a little premature but it arrived in the end. It’s not what you see but the way that you see it that matters and those who have access to the mind have created a world of zombies reared on junk. The magic of debt peonage guarantees that the entire benefit proceeding from any and all real economic activity is extracted years in advance. Hence the resort to increasingly sophisticated financial engineering and nirpzirp policies, which enables further rent extraction on the mere illusion of economic activity where none in fact exists. What a gullible breed, eh? Beats workin’. The reversion to the mean will not happen until “corrected” a month later, of course…If long-term discouraged workers are added into U-6 , the unemployment rate is about 23%….but I think the main point I can take away from the article is that the “government statistics” dare not get too far from reality, and they are pretty far now. With children being reprimanded for setting up lemonade stands or for mowing lawns, it is scary to think of making a product and selling it. The unemployment rate is a lot higher than 23% and everybody knows it and can see it by just looking around. Everybody with a job is over extended, working longer hours with less support, and of course less money. The Trumpster is the only one in politics with the nerve to even say it. Bernie Sanders is saying it, and proposing change that involves more than inciting people to fistfights and blaming immigrants. Bernie has been saying the right things for a long time and doing nothing about it. He and Warren do put on really good hearings on most issues…. and then nothing. Getting elected is about saying the right things to voters. Staying in office (and getting nominated) is about doing the right things for the big campaign contributors. Don’t be a dunce. The violence at Trump rallies has been initiated by professionally organized, physically aggressive, obnoxious protesters, many of whom were Sanders supporters and/or paid professional activists funded by George Soros organizations such as Move-on.org. In Chicago protesters used baseball bats to smash windshields in the parking lot and threw street debris at people lined up to enter the rally. Why are they even allowed to be there? Do you see any Trump supporters disrupting Bernie’s or Hildebeast’s gatherings? I wish we got such man in Canada for premier instead of poster boy. The unemployment rate is NOT a lot higher than 23% unless you include full-time school students, stay-at-home moms with small children, disabled persons and some retired persons. These people groups were never counted in the unemployment rate in the past for good reasons. They are either not able to work full-time or are not available to work full-time. And the vast majority of them are not even looking for work and why should they. ShadowStats unemployment rate of 23% is probably pretty accurate. So Petunia, how is it that you believe that the unemployment rate is a lot higher than 23%? How much higher? Are you making the mistake of counting all of the 94 million people who are not in the labor force, which includes people who are not able or available for work, in your unemployment rate? If I just looked around as you suggested I would see the vast majority of people working full-time jobs. And there are plenty of help wanted signs and ads in the paper. My own employer currently has a number of full-time jobs available. I would say that the true unemployment rate is around 12% in my area of the country if you include part-timers who want full-time work and long-term unemployed discouraged workers. But of course I realize that I live in a economically better area of the country then most people do. Couldn’t this article have been summed up in a single paragraph or not been so back and forth hem-hawing? I lost interest after the plenty of jobs absorbing massive oil sector losses conflicted with the title, can’t take the time trying to figure out a litany of riddles just to discover it’s a waste of my time. So having not read this piece due to it’s back and forth nature, I’ll just say if BLS report is good equities will likely sell off and bad is good for equities b/c our government doesn’t hesitate to reward special interest groups at the expense of prudent investors. Until further notice. It’s all a bunch of lies and misconception perpetrated by Wall Street as fodder so they can continue to manipulate the markets. In reality it’s the same as QE based on sensationalism instead of money printing. And money printing created the largest form of sensationalism in history. All of this just leads the sheep to slaughter on a daily basis in the stock market. Central Banks are now in massive collusion mode to keep their fake markets artificially propped up. This can and will continue until the day comes when a trigger hits. A series of Bank Defaults in Europe I suspect. And it’ll hit like a 8.0 earthquake and tsunami when it’s least expected by the general public. The smartest thing we can do is to prepare for it now if you haven’t already. It won’t be a banking crisis that triggers it. They can fake the numbers till dooms day. The trigger will be a war. Since the bringing the world democracy thing hasn’t worked out, I expect more drastic measures. I see the central bankers around the world trying their best to keep indebted borrowers (some way over their heads) from flopping. Sure, it would be great to begin to raise interest rates, but at what cost in pain to borrowers? We have not allowed the failed companies who should have failed as a result of 2008 to extend, and pretend for a decade with really no significant improvement in their debt positions. Oil & Gas is a prime example, sure if (when?) prices recover, so might they. When rates rise…. then what? Can we clean up the failed borrowers? As for the markets, it is where the bulk of my retirement is positioned. Where else can I get a 3% return, plus possible capital growth, except in real, working, profitable debt managed companies? Government Bonds? Please, do they have any ‘real’ value today? I thought I read unemployment claims are up 9% over the last three weeks. Is that correct? No idea why Zandi gets any attention. He knows little of what he is talking about. Yes, today’s numbers are up from a multi-decade low on March 5 (lowest since the 1960s!). So they’re still very, very low by historical standards. This article was written yesterday (before today’s numbers came out). I’m working on a new piece about job cut announcements in Q1. They’re soaring. But these are “announcements,” and they won’t translate into actual layoffs until months down the road. SOOOOOOOOOO, DO NOT SHORT THE MARKET based on a weak set of jobs numbers, as it is described in this article. Despite all the exposing of rot in the system on this site and others, the (financial) system will NOT collapse or experience any meaningful downturn in the foreseeable future. I would argue that as long as there is no change in central bank liquidity current bubble prices will continue, and maybe even rise. Never mind the daily tales of deceipt, manipulation, fraud, financial stress and incompetence – all this is known, and the market has discounted and priced it in. There are just too many people that have a vested and confluent interests in extending the status quo. And they have the means to make it happen. Nothing systemic is happening or will happen for the foreseeable future until there is a credible reduction in CB provided liquidity – and there is absolutely no sign of that happening. Let’s keep this in perspective shall we… A “challenged” economy means the Fed won’t raise interest rates, which means “stocks soar on improved Fed outlook”, which means the top 10-20%’s 401k’s keep increasing, which means the people that matter in the world are happy. You keep preaching a crush and recession??? Last time I checked, stocks were down from May 2015, revenues are down, earnings are down. And yes, rents are at all-time highs and people can’t afford them anymore. There are places in the country, including the Bay Area, where exorbitant rents are called a “Housing Crisis.” Is that sustainable? No. Something has to give. I don’t “preach” a “crush” or even a crash, but I do point at problems that you can choose not to look at, if you prefer, and then be surprised, as you were last time, when it all unravels. Hopefully you are being sarcastic. My comment was to JimmyP. seems like any numbers that come out will just be seasonally adjusted. if you work 3 jobs you are 3 people. if you say you are self employed and selling avon or whatever u can create maybe this is where the job creation is. maybe we can use another 100 million avon sales people in the world. but if they come out and say that things are poo then everything will be poo and it fall apart over night. to me they are trying to buy as much time as they can. I do hope someone does find a solution to the all the problems at hand. cause this situation is scary and serious and a lot of lives will be greatly changed again. and again so many will be blindsided. and everyone will say we didn’t know this was going to happen. so wolf if we gave you the keys to the kingdom what do you do? your opinion, what would you do. blank cheque to make things happen. People with no job, or a crappy job, have no disposable income. No disposable income means no purchases of poorly-made grossly overpriced crap from Chinese factories, and no tax income for the glorious State to buy votes from the permanent welfare class with. No purchases of poorly-made grossly overpriced crap from Chinese factories means no corporate income – with which to pay insane executive compensation packages or make debt payment with. I’m going to start selling cruety-free, organic, free-range, vegan, transgender cardboard boxes in California. Looks like an emerging trend – in housing. Wolf, I think it all needs to be said, thanks for putting it out there and asking questions for folks to make their own decisions. It’s all about perspective. What is sad is the number of homeless seem to be exploding.Notice seeing elderly men and women,where never see this trend before.This is shameful.Also notice more cars now look like residences.Do not expect this trend to end with illegals flooding the country competing for tax dollars,benefits and jobs. I think that’s what the politicians had in mind,third world country.